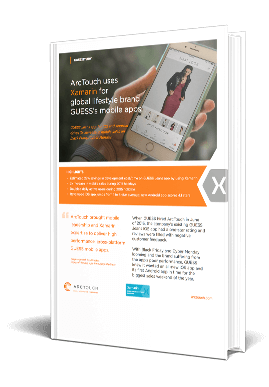 When Guess came to ArcTouch, it had just one app, GUESS Jeans, available only for iOS and with a one-star rating. With Black Friday and Cyber Monday looming, Guess wanted an all new iOS app and an Android app in time for the biggest sales weekend of the year. Learn how award-winning mobile app development studio ArcTouch used Xamarin tools —including Xamarin.Forms — as the framework to revamp the existing Guess iOS app and develop an Android app to meet their business needs. ArcTouch estimates a 25% savings in development cost/time from using Xamarin vs. using a combination of Objective-C and Java. The improved Guess app allowed a 3X increase in mobile sales and a 2X daily active users during 2015 holidays. The new GUESS Jeans iOS app rating increased from 1 to 3 stars. In Android, the app achieved a 4.1 rating.